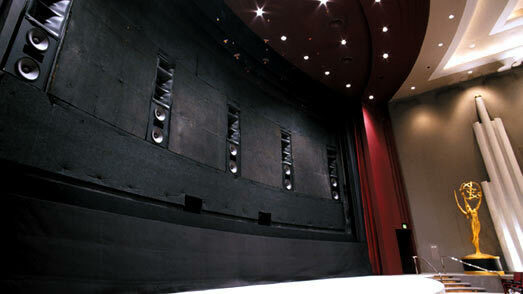 The capacity of theater room ,what is originally designed only for a "hometheater" is 250-cubic meter. The interception, absorption and modulation of the sound are elaborately considered there.It has isolated ground and 200V power line,signal line with wiring through hidden floor pit. This is a renewal site of "monolith-theater". I have arrived at this environments that specializes to watch movies, through experience for 30 years of pure-audio and 20 years of hometheater. Recently, defective operation has happened frequently with my consumer audio devices, while overhauling over many years, I tried to replace the system with professional devices. The site was started up as a chronicle because there were various surprises and discoveries in this process as an amateur. All image qualities are excellent by the impression of tens of blu-ray up to now. The image seen with DLA-HD100 looks more exact than the film. Because of the high resolution and contrast ratio, depth of scene is often real. 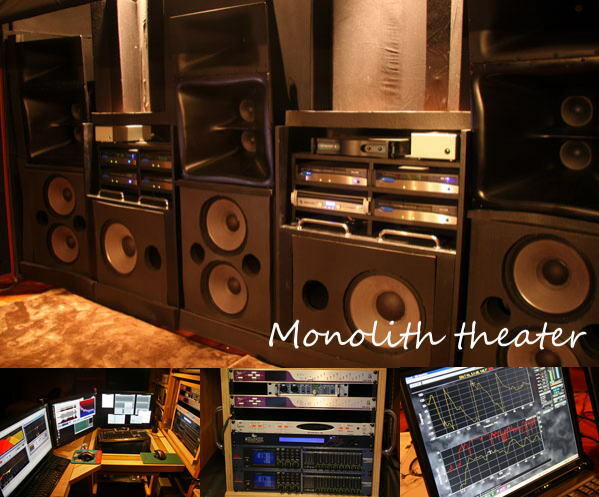 Screen Array system create an elegant, delicate, listenable and real voice. The preconception of the professional equipment that secure stable operation, sound volume and the head-room changed completely. It might be difficult to surpass this quality by combination of high-end audio devices for consumers, judging from my experiences of household machines as pure -audio. However, the tuning and optimization of professional devices with multi- amp system is extremely difficult. For example, it takes over three days by FFT analyzer "Smaart", until constant flat characteristic data of the response in frequency is obtained including room acoustic equalizing. The dialog seems as if to see the movement of the lip and the throat. It is real to make it think there is an actor in the back of the screen. Each musical instruments are able to be listened lucid separating one by one in the orchestra. Transient characteristic quality such as brass and woodwind instruments is excellent. Response of low frequency is very tight. I think that it is a synergy effect of amplifiers with high density power and damping factor, natural digital devices without coloration, unique mid-range double unit with horn and double woofer of 3632T. The horn in high frequency band is average. It is a preamp of DENON that has colored character most in this system. On the other hand, the reproduction as DAW system via firewire and AES3 digital signals by PC is accurate. In some movies,I can feel the orchestra instruments how like exists and sings. I can hear the orchestra pit in the theater under of screen. Musical instruments queue up from near to far and right to left.When equipped 8 surround speakers, the surround is so natural that the sound-image moves from center to outside the screen and side to back smoothly. The density of the sound that develops with overhead is high. I have not experienced such the sense absorbed in stories without feeling the sign of devices. Only the movie exists there. remote control 5-meter adjacent attention possible. In US, CROWN professional Com-Tech(CTs) series. CTs series is professional equipments. It has high power-density. 8-ohm Dual:600W(CTs1200) ,1250W(Cts3000).and 8-ohm Bridge 3000W(Cts3000)..Damping factor is over 3000.Total harmonic distortion(TDH) at full-rated power, from20Hz-20kHz is under0.1%(CTs1200) and 0.35%(CTs3000).Units driving potential and sound quality is excellent . with LT-FW expansion interface simultaneous 16ch AD/DA front-end Processor designed for recording and mastering studio use.16ch analogue and 24bit AES3/EBU digital I/O,Clock setting up to 192kHz, mixing/routing with external PC control available by Lynx driver. LT-FW is designed to be used with IEEE-1394a FireWire signals. 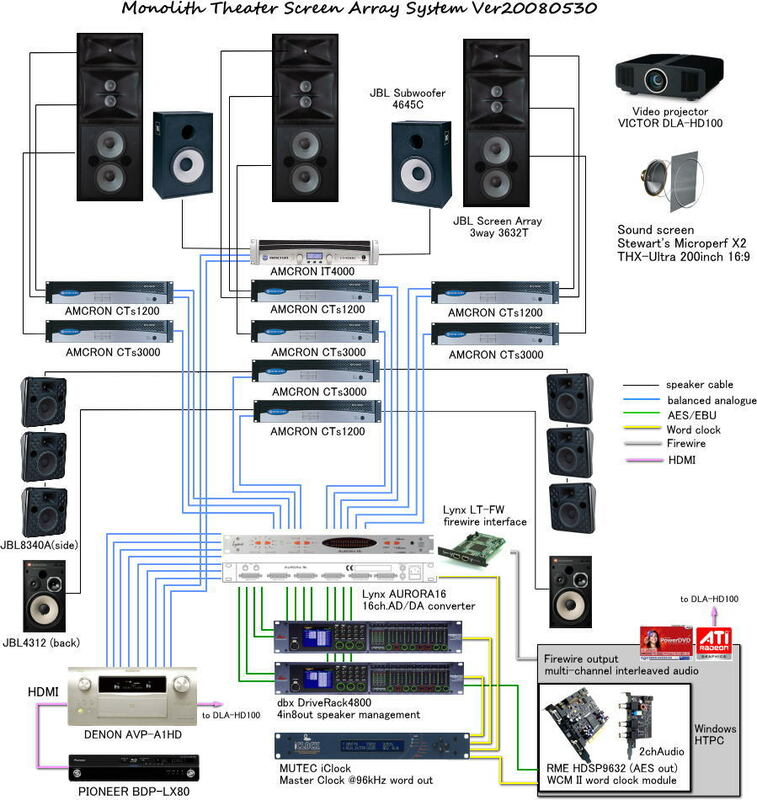 ASIO and multi-channel interleaved audio (7.1ch surround sound) available. master clock MUTEC iClock digital sync for Lynx,dbx and PC accuracy<0.1ppm,jitter<1ppm,Synchronization and generation of 36 different Word Clocks rates at the same time.DSD,DXD,SACD mastering,10MHz Rubidium clock input available. software EAW Smaart optimization of crossover in 3way screen channel (JBL3632T),parametric EQ for side speakers and total tuning room acoustics professional tools for optimizing the interaction between sound system and the space.Its very difficult to tune Screen Array System by hearing only.Two-channel RTA,Single channel spectrograph.Frequency response magnitude and coherence measurement available. Special theater room of original design: 250 cubic meters in volume, floor space 50 square meters, 5 meters in height, 30 seats maximum accommodation number in the first floor and 4 in the second. 200-inch(4.7x2.7m,1.78:1),Studiotek 130G3, Microperf X2 THX-Ultra sound screen by Stewart. High-definition(1080p) front projector by Victor DLA-HD100. JBL Professional cinema speakers; three way "ScreenArray" 3632-T (Tri-amplified operation), 4645C, 8340A. dbx4800, equalization & loudspeaker management system with bandpass filters, crossover and parametric EQ by "HiQnet" (Harman International) networking and control. Sound tuning with "Smaart" by EAW : audio system measurement, acoustic analysis FFT realtime tool, provides to assess the performance of an entire sound system, a specific part of a system, or a single system component. Cooperation of Lynx AURORA16 as AD/DA front-end processor with dbx4800 and analog signal devices. Control with clock master "MUTEC iClock" for digital devices. Blu-ray reproduction player "PIONEER BDP-LX80"and AV preamp"DENON AVP-A1HD" for consumers. Software decode full high-definition image and multi- channel surround sound by self-made PC. Clean power supply step-down transformer from exclusive use 200 volt. Self made devices: auditorium sofa, power and analog line, 19-inch rack, amplifier rack, acoustic panel and PC etc. Machines were bought by the mail order, and set up for myself. Leonard H. Goldenson Theatre. Academy of Television Arts & Sciences Plaza.The Leonard H. Goldenson Theatre is equipped to project 16, 35 and 70mm film as well as video, delivering high-end audio through an advanced JBL sound system.